Join our Loyalty program and enjoy the benefits of collecting points, you can use points to Treat Yourself to a scrumptious lunch or a cheeky cocktail or two! Once you have completed the form you will receive an email (within 48 hours) confirming your card is ready for collection. The cost of the card is £5.00 and comes pre-loaded with 500 points (equivalent to £5) to spend on your next transaction. 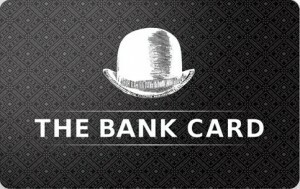 At all times The Bank Loyalty Card, entitles the bearer to 3 points for every “£” spent on the total bill, which you will then be able to redeem against future purchases. You will be able to “ROB” The Bank Manager for extra points at certain times and/or products. Make sure you keep an eye on our social media sites and internal advertising. This is where all special offers related to the Loyalty Card will be announced. We don’t want anyone to miss out, so please share with family & friends.